The tiny town of Talbot will celebrate the 10th Anniversary of its popular Farmers’ Market on Sunday 16th March from 9am -1pm. The Talbot Farmers’ Market began quietly in 2004 as one of the earliest farmers’ markets in regional Victoria and continues to be a growing success a decade on. The market, set down the road in the beautiful historic precinct on Scandinavian Crescent in Talbot, connects local and regional farmers, growers and artisan food producers with market goers from far and wide. From humble beginnings the vibrant market remains proudly community based. Gillian Sweetland, one of the founders explains how ten years ago a band of passionate locals with “an incredible variety of talents, skill and commitment” pulled together to make the Market happen. Their hope was to “stem the demise of a small town and create a legacy to underpin the livelihood of its old and new residents. It’s obvious that the dedication was infectious and I am very proud of the community’s success.” A success it is, today the market continues to draw over 2000 visitors to town on the third Sunday of every month. The Talbot Farmers’ Market boasts an impressive display of over 80 stalls of regional produce including seasonal fruit and vegetables, organic produce, freshly baked bread, gourmet cheese and meats, local wines, organic oils, artisan and gourmet delicacies, livestock, plants and much more. To mark the 10th anniversary milestone, the Talbot Farmers’ Market will host a series of short ‘Meet the Farmer’ talks, with presentations from an organic vegetable grower, bio-dynamic lentil farmer, an apple orchardist, an organic oil seed producer and a passionate vermiculturist poet. The farmers will talk on a range of subjects from the challenges of farming to looking after the environment and more in depth topic of genetically modified foods. These talks will provide an opportunity for market goers to better understand where the products they enjoy at the market come from and to really connect with stallholders, many of whom have been with the market since day one. The Talbot Farmers’ Market is not complete without its popular “Barrow Raffle” and to celebrate the decade milestone there will be a total of 10 draws in this months raffle. Prizes will include vouchers to dine at local eateries such as Bryce’s Bistro, Ripples Cafe and the Talbot Courthouse Hotel. There will also be a chance to win bottles of wine from Kangaroo Hill Organics and Amherst Winery and hampers of product from Stoney Creek Oils and Pud for All Seasons. Raffle ticket holders will also be in with the chance to win a stack of “Talbot Farmers’ Market Money” to the value of $100 to be spent at the market and luxury overnight accommodation for two at Talbots Chesterfield House. Three little pigs will also be coming to the market to be raffled in the wildly popular ‘Pig Raffle’. 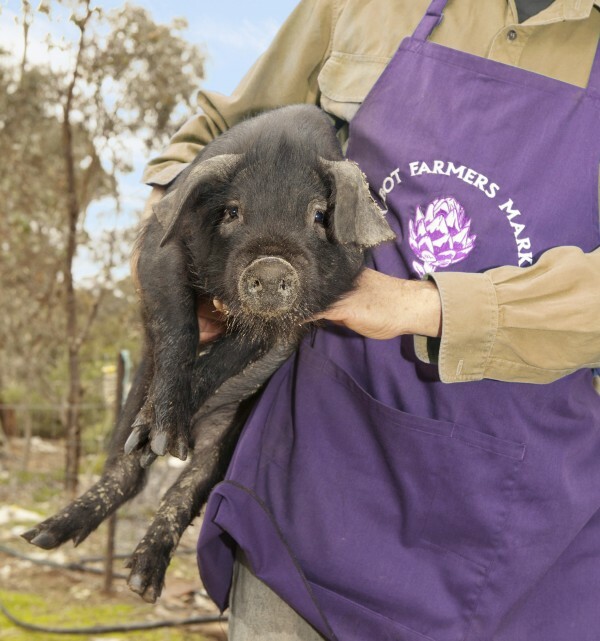 The rare breed black pigs are farmed free range just outside of Talbot by John of Ragin Pigs and have been a feature at the market since day one. While always drawing a crowd of both little and big kids alike the pigs are sure to create a stir this month, especially with market goers having the chance of winning and taking home a pig of their very own. To complete the vibrant village atmosphere there will be live music played in the street by local musician Kim Ritche and the Maryborough Highland Pipe Band. Visitors to the Farmers’ Market can also drop by the adjacent Town Hall Market, where they can browse and buy delightful and unexpected handmade treasures. Don’t miss this wonderful milestone and share in the celebrations at the Talbot Farmers’ Market on Sunday 16th March 2014.